Kevin Tamul (3L) delivered the second Student Scholars Series lecture of the semester on March 15. Tamul’s scholarship argued that the use of the Privileges or Immunities Clause is a practical means of resolving the current circuit split over the state’s power to regulate intrastate commerce. 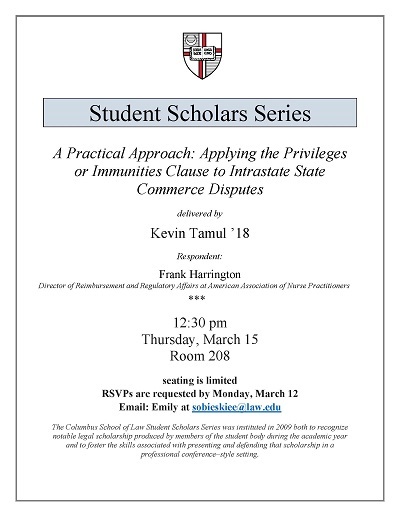 Tamul, Kevin, "A Practical Approach: Applying the Privileges or Immunities Clause to Intrastate State Commerce Disputes" (2018). Student Scholar Series. 29.